One of the things I love most about having a food blog is that people now send me recipes. I get them all the time from friends and family alike. “Hey, why don’t you try to veganize this chili burger?” Absolutely! The latest was from my friend Pamela with the note “I made this tonight. It was super good. We had it with black rice and garlic naan bread. The small rascals even ate it!” How could I not give it a whirl? It’s from Canadian Living. It’s fabulous. And it’s a welcome change from the Indian food the kids like to order that I’m sure is packed with ghee. Black rice and garlic naan bread are wonderful accompaniments, as is aloo gobi. Presto, dinner’s ready. Heat olive oil in a heavy-bottomed pot or dutch oven over medium-high heat. Add onions and sauté until softened, about 5 minutes. Add minced garlic and ginger and cook for another minute or two. Stir in chili powder, coriander, cumin and garam masala. Cook until fragrant but be sure not to burn the spices; about 1 minute. 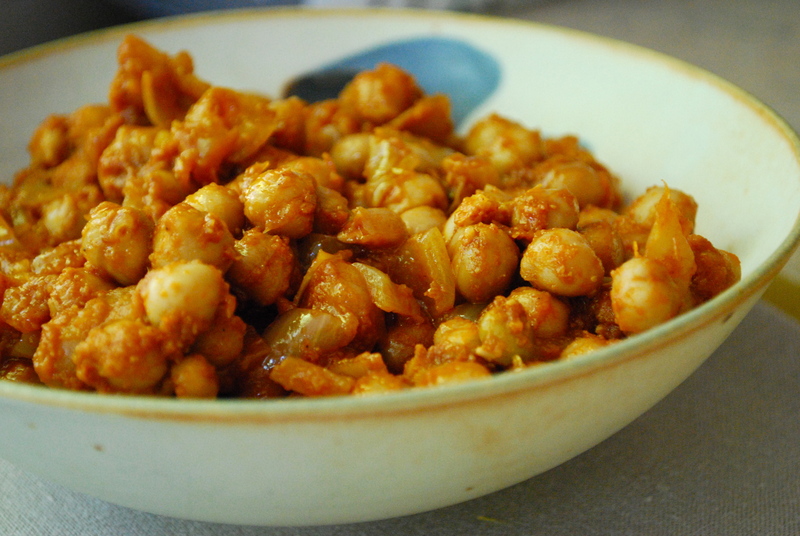 Stir in 1 cup water, tomato paste, brown sugar, salt, and chickpeas, scraping up any browned bits. Reduce heat, cover and simmer until thickened slightly, about 15 minutes. Stir in lemon juice. Serve piping hot.